How to watch Arrow: Season 2: City of Heroes on Netflix Denmark! Yes, Arrow: Season 2: City of Heroes is now available on Danish Netflix. It arrived for online streaming on October 4, 2017. We'll keep checking Netflix Denmark for Arrow: Season 2: City of Heroes, and this page will be updated with any changes. 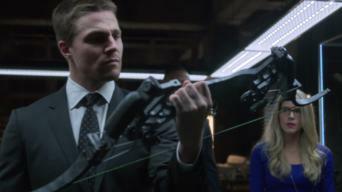 With Starling City and Queen Consolidated deteriorating fast, Diggle and Felicity travel to Lian Yu Island to convince Oliver to return as the Arrow.